This is a bit of motorcycle racing history, I guess, since the majority of these tracks don’t exist anymore. I’ve included track diagrams of each but I’ve never found the flat diagrams adequate since they don’t show terrain, which can have a profound impact. For example, a flat Sears Point would be very different than what actually exists. For some of the tracks I’ve included a photo or two to give a better idea of the track’s scale or elevation changes. The Sears Point track, near Sonoma, California, has changed some since the 1970s, mostly to increase safety and to provide better viewing. The section from turn 8A to turn 1 is different, and the track is a bit shorter than it was in the 1970s. It’s called Sonoma Raceway now, but I’ll describe Sears Point, the 2.5 miles-per-lap 1970s version of the track. I’ll be using past tense although some of the features described are still around today. The track was placed on the edge of a grass covered, rounded hill at north end of San Pablo Bay. The towns of Novato to the west, Sonoma to the north and Vallejo to the east were all about the same distance to the track. It was really pretty in the spring when the grass was green, but as summer came in it got dry and the grass turned brown. Most of Sears Point’s 2.5 miles was draped on the side of that rounded hill. The result was a collection of tight turns and rapid elevation changes. The track had a split personality; turns 1 through 6 were the “hill section” and featured tight turns, many of them blind, some of them off-camber, with rapid elevation changes. Turn 1 to turn 2 was steep up hill. There was a dip just before turn 3, then another steep uphill to 3A. The crest at turn 3A was the highest point on the track, about 180 feet above the S/F straight (if that is too abstract for you think of it as an 18 story building). There was a steep downhill plunge to turn 4, continuing downhill to turn 5, then uphill to the crest at the entrance to the Carousel (T6). The Carousel was downhill, not as steep as the 3A-4 chute but a fair drop and all the while you are turning left. This is a shot at turn 3A that shows the steepness of the rise from 3 to 3A. Steve McLaughlin (83) is about to hit the top of the turn with Randy Mamola (26) right behind him. I’m #9, just starting the climb from 3 to 3A. In the background far below is the Start/Finish area and the two-story scoring and press building. Photo by Anna Vallerga Homchick. There was a gradual climb from the exit of turn 6 up to the turn 7 hairpin. After the hairpin the track slithered downhill in turns 8 through 10, collectively called the Esses. From 8A to turn 9 was a steep downhill and you could really get up a head of steam through turn 9. Turn 10 may have been the fastest turn on the track and turn 11, the pit hairpin, was the slowest. This section of the track, turns 7-10, was faster than the hill section, more flowing and mostly gradually downhill. From turn 10, past the start/finish line and up to turn 1 the track was level. After turn 1 it was back uphill to do it again. The view from the turn 7 hairpin showing how high above the Start/Finish area it is – and turn 3 is even higher. The S/F line is near those white walls on the right side of the photo. Note turn 8 is blind. This is looking south towards San Pablo Bay. The hilly nature of the track resulted in many blind turns – the track kept disappearing over a hill or around the edge of an embankment. There were twelve numbered turns, the blind turns were 2, 3A, 4, 6, 8 and 8A. Turns 4, 7, and 11 required hard braking. The track goes up and down, left and right, without any long straights where a rider can relax and let the bike do the work. Not only was it tight and twisty, it was bumpy. Fast times at Sears were earned by hard work and sweat. I can’t really claim Sears Point was a “fun” track to ride, but it was deeply satisfying when I got it right. I loved racing there for the challenge it presented. There’s no photo showing the elevation changes at Ontario because there weren’t any. OMS was flat as a pancake. Located in Ontario California, about 40 miles east of Los Angeles, the huge facility never seemed to be able to cover its debt requirements and it was lost to development in 1980. After racing at Sears Point, Ontario was an eye-opener; it was different in many ways. The OMS track had no elevation changes. The turns had lots of run-off room. The pits and paddock areas were paved not gravel. There were garages so we didn’t have to work in the sun. There were 20 numbered turns (but no turn 13), including many fast sweepers, and there were two straight sections, a long infield straight and the really long main straight. The main straight and turn 1 were part of the Super Speedway while turn 2 was the entrance to the infield. The track had lots of fast, large-radius sweepers, and four corners that required heavy braking. A Superbike rider spent a lot of time in top gear with the throttle held wide open at this track. It was quite a bit longer than Sears Point – 3.19 miles vs. 2.5 miles. Everything about it was bigger. It had something else we didn’t have at Sears Point – smog. The air was actually brown, and on really bad days it hurt to breathe deeply. Some of the experienced racers brought oxygen bottles and masks to the track to breathe from during breaks. I had been there several times before the wind blew the other way and I saw 8,000 foot tall mountains starting only 6 miles north of the track. Those mountains and the Chino Hills just south of Ontario acted as a funnel and when the wind was blowing west, as it usually was, all the L.A. basin smog was concentrated on Ontario and the nearby towns. The Sears Point track has nearly everything one needs to become a complete racer. What Sears was missing Ontario had in quantity: long, fast, flat sweeping turns. Racing at Ontario taught me to look ahead, an important technique in racing. Looking ahead at Sears Point didn’t help much because the track had so many blind turns — it played hide-and-seek as it kept disappearing around a corner or over a hill. I had trouble learning the OMS track. There were so many turns and some of the left hand sweepers looked nearly identical. I kept getting turns 7-8-9 and turns 12-14-15 mixed up. I’d be ready to run down the long infield straight only to find a tight right hairpin turn, or vice versa. It was frustrating. Then I made an important discovery: I could look ahead. The track didn’t disappear around a corner or over a rise – you could actually see what was coming up. I started looking ahead at all the turns and my riding smoothed out and lap times dropped. Racing at Ontario taught me something I couldn’t learn at Sears Point. Once I figured that out I had a lot of fun on that track. 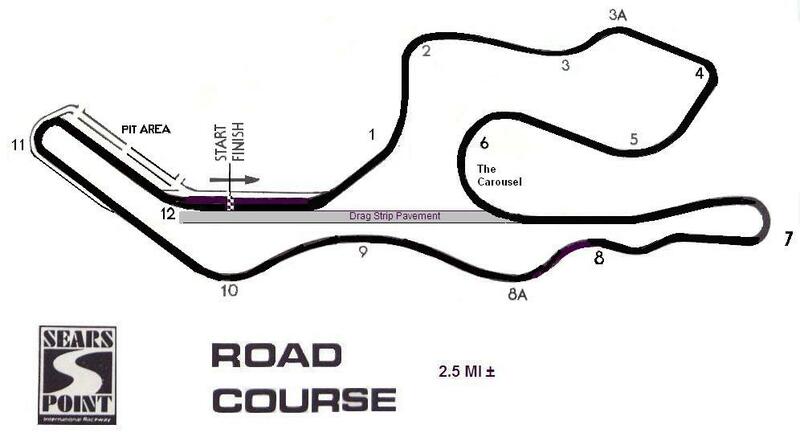 Riverside International Raceway, near Riverside California, was a really fun race track and is missed by many folks. It was closed after the 1988 racing season and is now covered with a mall, apartment buildings and houses. Sigh. Riverside was a fast, flowing track with gentle elevation changes. 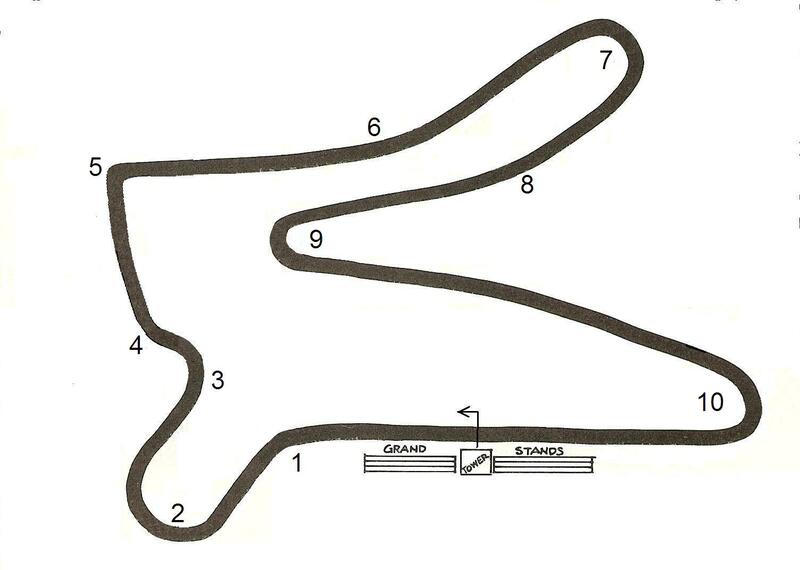 The track had a set of right-left-right-left-right-left turns (2-5 on the map) called the Esses that required good handling – the bike had to change direction quickly and precisely. Actually the numbering system was deceptive, as each one of turns 2 through 5 was a right-left combination. In reality the Esses had 8 turns not 4. There was a hairpin turn 6 that required heavy breaking. Turns 7 and 7A had an elevation change – just before turn 7 there was a slight rise then the turn itself was slightly downhill. 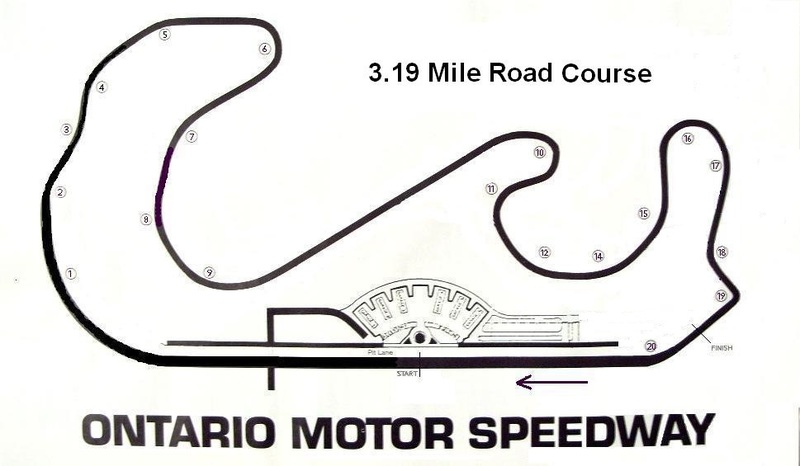 The back straight was very slightly downhill, with a left hand dogleg that was taken at full throttle on all but the fastest bikes; The back straight was over 3,000 feet long, a full half mile of wide open throttle before you had to slow for turn 9. The final turn was a very large radius more than 180° slightly banked sweeper that was taken at high speed leading onto the short front straight. The start of an AFM lightweight race showing the slight rise to Riverside’s turn one. The esses followed, leading up to turn 6. The red & white outside wall of turn 6, the highest point on the track, is visible in front of the distant grandstands. Photo courtesy of Bill Mullins. It was a very fast track, with lots of high speed turns. The hairpin was the only slow turn, the 7/7A combo was medium speed, and the rest of the track was fast. I got a true sensation of speed from Riverside. There were things right alongside the track – grandstands at turn 6 and a wall on the outside of turn 9, for example – and you sensed the speed as you went down the track. Ontario, in contrast, was just as fast but there was so much run-off room you didn’t get the same sensation of speed. The effect distorted my perception. After the first time at Riverside I was driving the race van on the freeway towards home, and was getting really frustrated by the traffic. Why is everyone driving so SLOW!? I thought. Then I glanced down at the speedometer and saw that I was going 80 mph. Gulp. I had to re-adjust to an every-day speed scale. Dale (my sponsor and tuner/mechanic) and I went to Daytona in 1978. My impression of this part of Florida was that it was very flat with lots of water slowly moving toward the sea. I thought Ontario was huge but Daytona was even bigger. 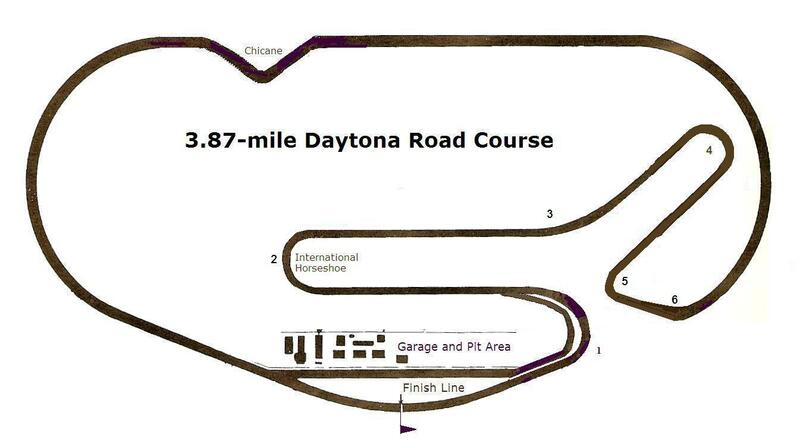 The track we raced on was the classic Daytona 200 course. Turn 1 has been altered slightly but it’s pretty much the same track as used today. It wasn’t very complicated: the infield had three horseshoe turns of varying radius, a dogleg left at turn 3, a 90 degree left at turn 5 and a sweeper onto the famous 30 (or 31, depends who’s talking) degree banking. The first banked turn lead to the long back straight which is interrupted by the left-right-left chicane, there to slow the faster bikes. After the chicane is the second 30 degree banked turn then a run to the slightly banked start/finish curve. The Formula 750 bikes quickly gobbled up the straight sections but riders of the slower Superbikes spent a lot of time in full tuck on full throttle. This photo, taken from the grandstands near the finish line, shows the huge scale of Daytona. In the foreground is turn one. The International Horseshoe is off photo to the left. The track re-enters the photo at the exit of the dogleg turn 3, and turn 4, 5 and 6 are in the shot. The banking starts at the right edge of the picture and sweeps all the way around to the left edge. Those little shiny things you see between turn 4 and the banking are cars and trucks. Photo by author. Most bike racers didn’t use the garages but instead set up in the open air pit areas, which were covered to protect from the rain — and it always rains sometime during Speedweek. The security was so tight we could leave the motorcycles and tools at the track with no fear of them being stolen, but you better not forget your participant pass. “Oh,” she replied in a deadpan tone, “we drink a lot.” OK, I thought to myself. The Bryars Motorsport Track was as small as Daytona was big. This particular configuration, which doesn’t exist anymore, was less than two miles per lap. As you can see from the diagram it was mostly hairpin turns connected by short straights. Turn 1 was a sweeper, turns 3 & 4 were a quick left-right combo and turn 5 was a tight 90 degree right. Turns 6 and 8 were taken at full throttle on our Superbikes so I didn’t count them as turns. The straight from 5 to 7 was slightly uphill, then gradually back down to turn 9, which dropped downhill as it went left. That meant four out of eight actual turns were hairpins. Passing in a hairpin is always difficult so finding passing zones at Loudon was a problem. This photo illustrated the small scale of the Loudon track. The pavement enters the picture on the left showing the turn 3-4 combination, the short chute to the tight right-hand turn 5, then the straight going slightly uphill toward turn 7, which is off the photo to the right. The small size of Loudon had an advantage for the spectators – you could see the whole track from the grandstands. The short track meant the fast bikes were lapping slower bikes after only a few laps and traffic was always a problem. The rider who could get as good start (not me) or who was good at cutting through the back markers could do well here. Track map courtesy of Mark Homchick. The Pocono Mountains of eastern Pennsylvania were very pretty and a popular honeymoon spot, not far from New York City and Philadelphia. They are East Coast mountains so not very tall and well forested. The Pocono race track is near the village of Long Pond, in a level plain within those mountains. The track itself was, well, a bit odd. 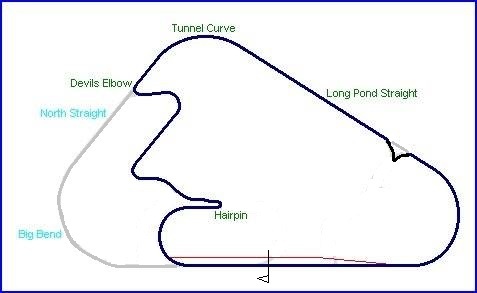 Pocono was a super speedway but instead of an oval it was a triangle. The curves were slightly banked, not like Daytona but more like Indy. The motorcycle course used a lot of the speedway track with a totally flat, rather rinky-dink infield section. I don’t have a photo to show the scale but it was pretty big. The straights were long and very bumpy. Those were NASCAR and Indy car straights and we used about two thirds of it (the part we didn’t ride is shown in grey). The course was 2.8 miles per lap with the Long Pond straight being nearly ¾ of a mile. Looking at the current website and satellite images shows that this infield section no longer exists, and good riddance. One nasty feature was the wide, sweeping turn one that led to a dead-stop hairpin. The bikes could go through turn one 3 or 4 abreast then they had to merge into the single-file hairpin. It worked exactly like a funnel with lots of faring banging or paint swapping on the first lap. After the hairpin the track snaked around a bit, then a sweeping right turn onto the infield straight, a sweeping left then a sharp more-than-90 degree right turn back onto the speedway track. That turn was aptly named Devil’s Elbow. My friend Mark Homchick describes racing there: “Imagine going down the freeway, exiting to do a quick lap through the 7-11 parking lot, and then getting back on the freeway.” I didn’t like Pocono much. Too much straight, not enough curve. 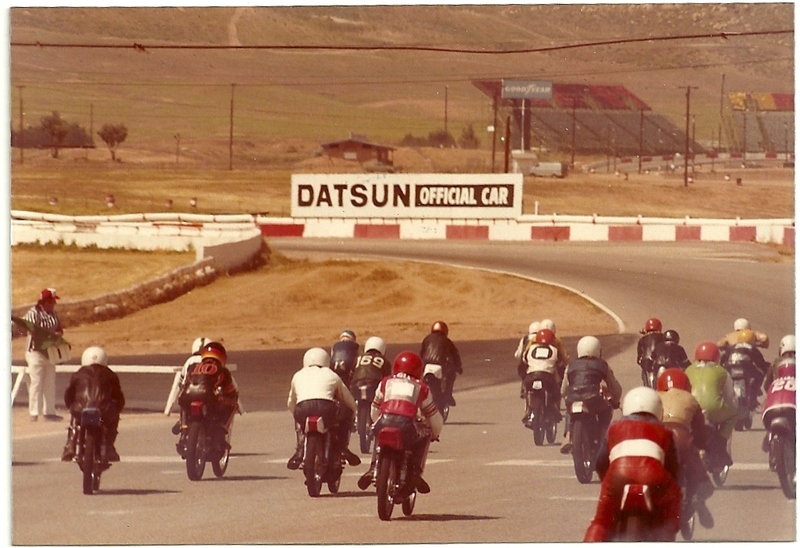 Laguna Seca of the 1970s was different than today’s track. The new section, added in the early 80s, is shown here with a dashed line. The 1970s track was short, only 1.9 miles per lap. It went from turn 2 directly to what is now turn 5. I’ll describe the 70s version of the track using the past tense even for the parts that are still there. The short start/finish straight was uphill to turn one, a blind crest. Turn two was a fast left sweeper, then a short straight to turn three, another fast left sweeper. There was a short straight, slightly uphill and under the bridge to a medium tight left at turn four. This was a nasty turn with Armco barriers on the outside and a sharp drop off. If you crashed here and somehow got past the Armco you might stop rolling by Salinas. The straight between turn 4 and the Corkscrew was steeply uphill. The Corkscrew was a left-right combination that lost elevation rapidly. I mean really rapidly. 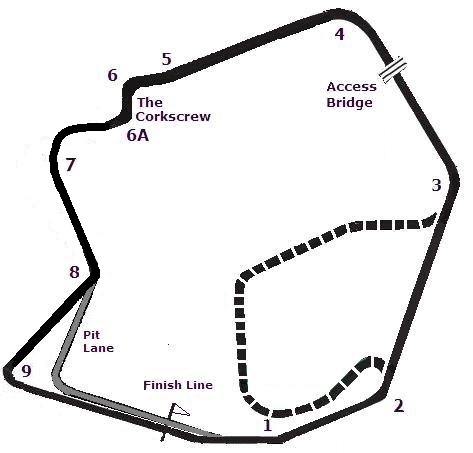 The Corkscrew was followed immediately by turn 7 (now called Rainey Curve) still going downhill. There was a short straight downhill to the right-hand turn 8, which was nicely banked and could be taken much faster than you would think. Another short straight lead to the tight turn 9, the tightest and slowest turn on the track. Once through there it was a climb to the S/F line to do it again. It was almost a circle track, with only two right turns and seven lefts. The right-handers were the second half of the Corkscrew and the banked turn 8. Turn 5 was technically a right hander, but the Superbikes of that era went through it full throttle so it didn’t count. A really fast Superbike lap in 1978 was about a minute and 12 seconds, which calculated to an average speed of 95 mph. The Superbike lap record that year was 1:11.4, set by myself on Dale Newton’s 905cc Ducati. Make no mistake, the old Laguna was a fast track with a rather narrow racing line and it was hard to find places to pass. It was also a fun track; I liked racing there a lot on the Ducati. One feature of the 1970s Laguna track that most people don’t know of was the curbs on the insides of turns 2, 3, and 4. Most tracks had low profile smooth curbs or rumble strips on the apexes and exits of corners, the sort of thing you could run over and still stay on your wheels. 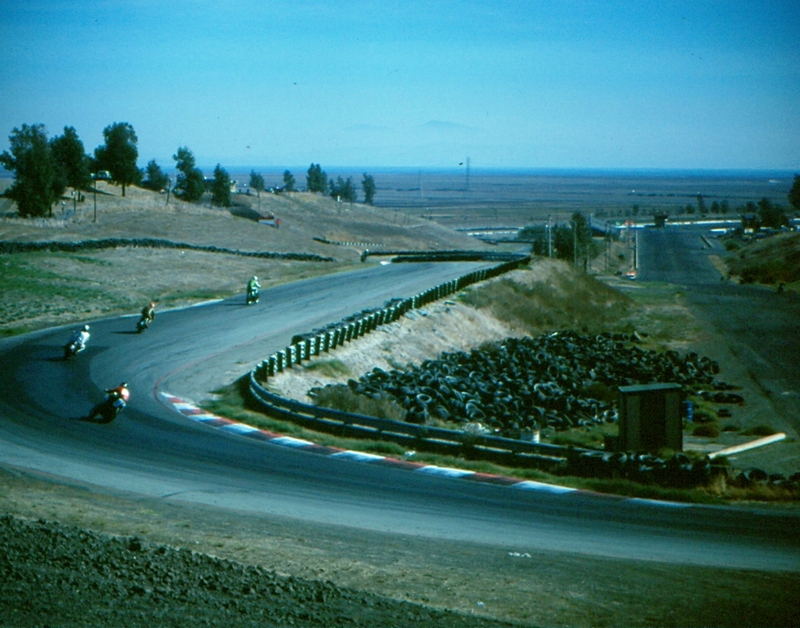 See the above picture of turn 7 at Sears Point, for example. There were real curbs at Laguna Seca. Solid concrete at about a 45 degree angle and tall. I could easily imagine smacking my crankcase against the curb and going down if I cut the corner too close, even if I kept my wheels on the pavement. For the wider 4-cylinder bikes it was even scarier. It made passing on the inside of those corners impossible unless the rider in front left the door wide open. Well that’s it. 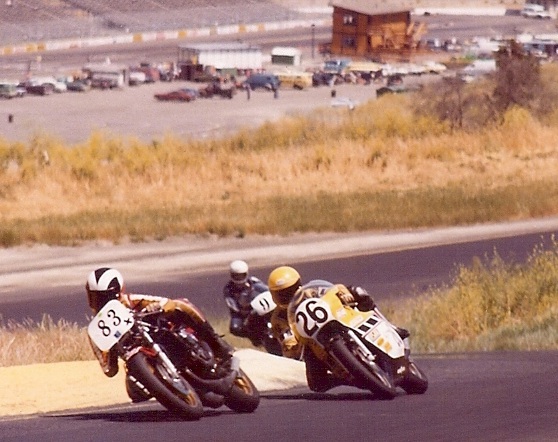 Seven racetracks I have known, from my club racing days and the AMA National races in 1977 – 1979. I’ve also raced once at Portland International Raceway in Oregon, once at Willow Springs in California, and had a track day at Pacific Raceway in Kent, Washington, but I never really got to know those tracks well enough to be able to describe them.